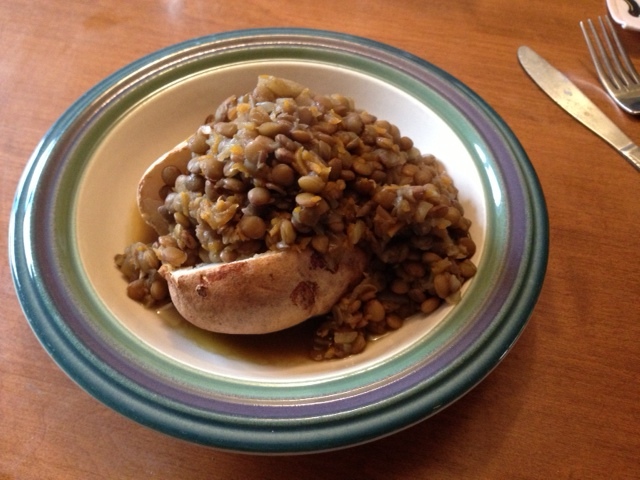 I just ate lentils and a potato. Again! It didn’t take long to heat up today but yesterday it took a couple of hours to make the lentil stew. Chopping up the ingredients and simmering everything long enough to soften up the lentils takes time. I have the luxury that I can work at home if necessary so that’s what I had to do to keep an eye on the stew. For breakfast, I had a boiled egg and one piece of toast. That’s all I was planning to eat but I was still hungry. I wanted to make a peanut butter and banana sandwich but I was running late to drop my kids off at preschool. I scanned my pile of food and realized I really don’t have much that I can just grab and go. My only option was a banana to eat on the way. No granola bars for me. Now I’m down to just 2 bananas. Before I left for work, I also had to prepare the beans for dinner. I’ve never cooked with dry beans before but I do know you have to soak them so I set them up ready for my dinner of beans and rice tonight. I’m learning that this kind of bulk food may be cheaper but it requires a lot of planning and time, as well as a full kitchen, which is something that a person on welfare may not have.